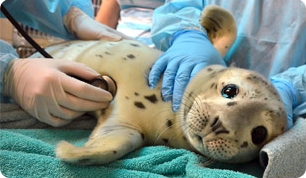 To report a stranded marine mammal: call (415) 289-SEAL or email rescue@tmmc.org (photos especially helpful). For visiting options and our Education Programs, contact: edu@tmmc.org or call 415-289-7330 (Mon-Fri) or 415-289-7376 (Saturday - Sunday). For general inquiries, contact: info@tmmc.org. For questions about giving, contact: give@tmmc.org or call (415) 289-7335. For questions about volunteering at the Center, contact volunteer@tmmc.org. For media inquiries, contact: media@tmmc.org or call (415) 289-7361. To report a Hawaiian monk seal sighting, call (808) 987-0765. For questions about volunteering in Animal Care, contact: McGinnisM@tmmc.org. For questions about volunteering in Education, contact: spiegelt@tmmc.org. For questions about volunteering in monk seal response, contact: simeonec@tmmc.org.